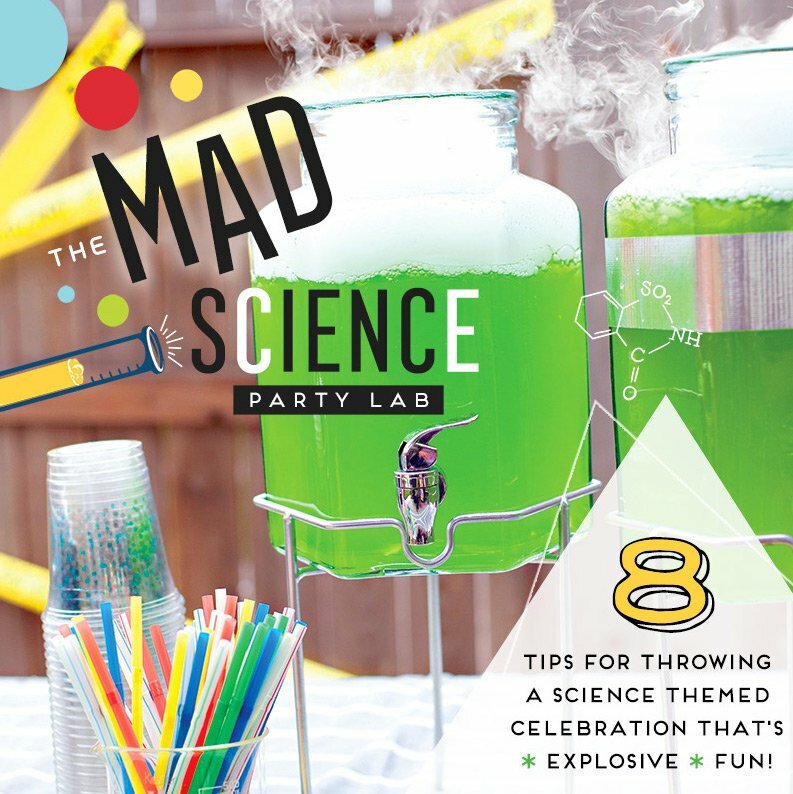 One of my favorite parts of being a wedding and event planner is designing an event for friends and family. 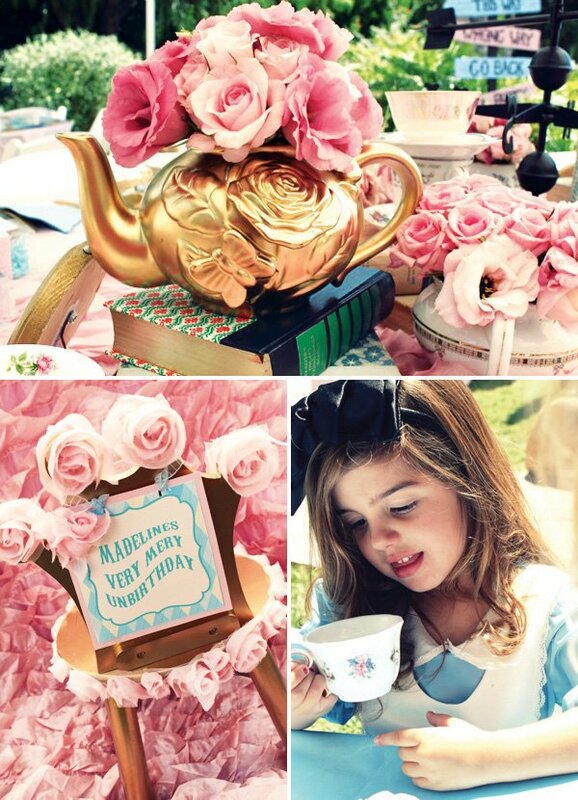 This Alice and Wonderland Tea party was for my daughter Madeline who turned 3! 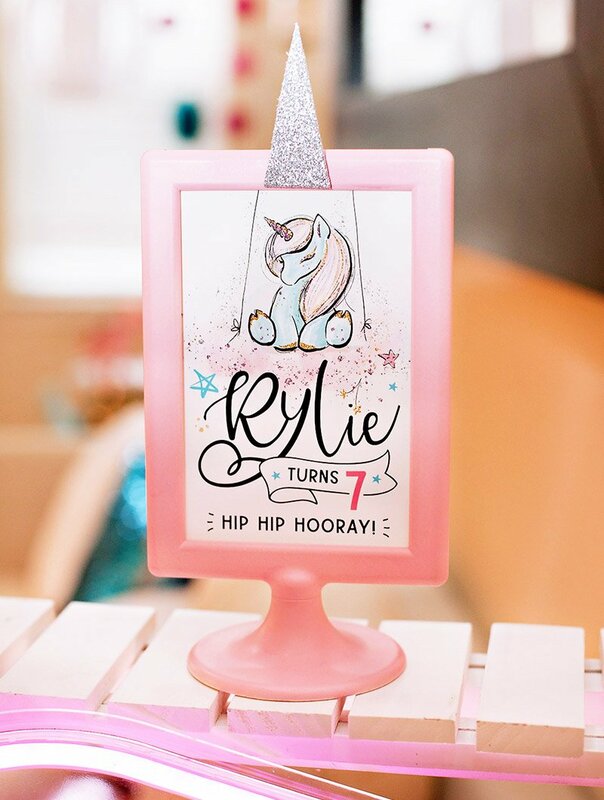 It all started with the adorable invite designed by Anders Ruff. I then spent a few months visiting local thrift stores and antique stores collecting various teapots, tea cups, saucers, china, and books. 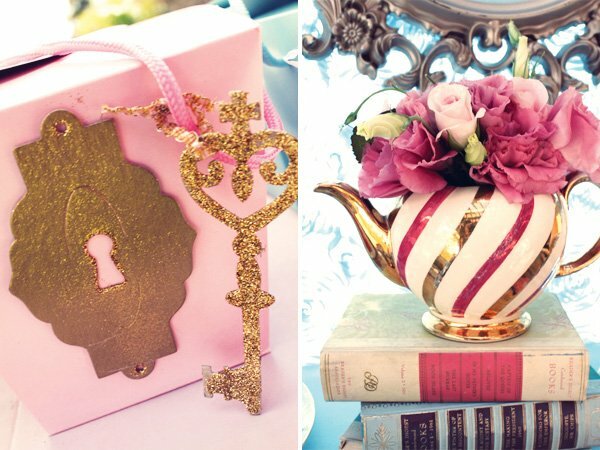 The teapots that weren’t visually appealing I had the idea to spray paint them gold. 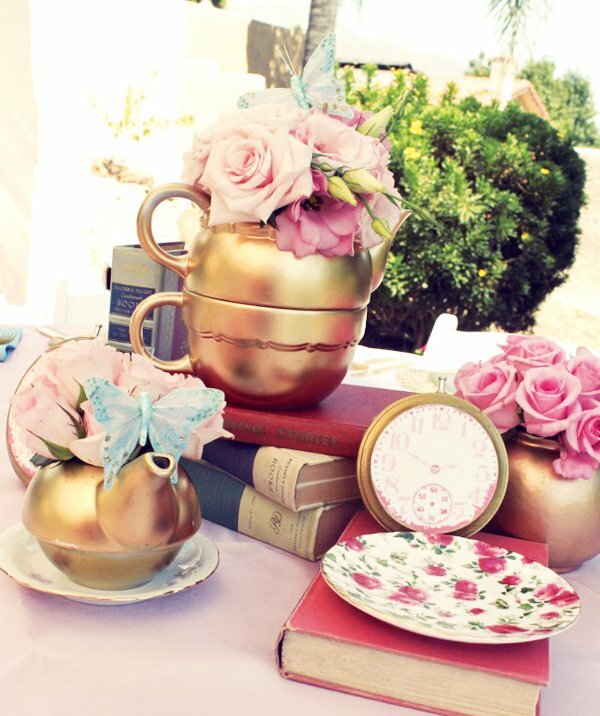 I mixed in the gold teapots with teapots that had beautiful floral patterns which worked perfect! 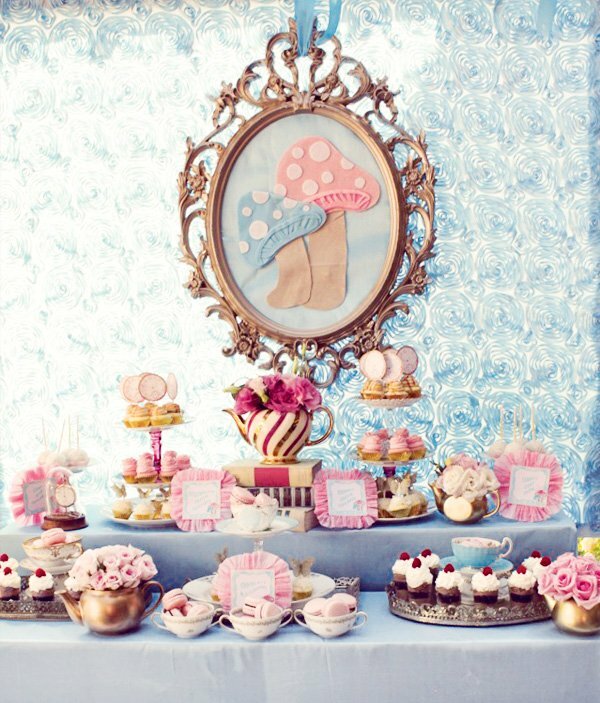 For the dessert bar I couldn’t resist working with my favorite bakery, The Sweet and Saucy Shop. 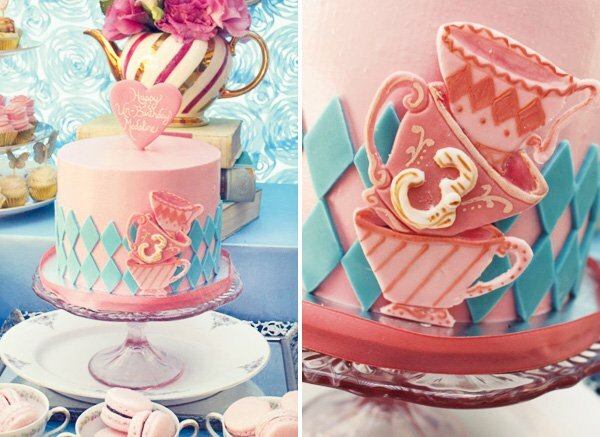 I took the invitation that provided the parties inspiration to the bakery and worked with them to come up with a cake design. I used printables from Anders Ruff to make clock cupcake picks. I also purchased the Martha Stewart brand gold butterfly stickers for cupcake picks. Using the mismatched china plates I found, I used gorilla glue to assemble different sized plates to candlesticks and cups to make tiered dessert trays. 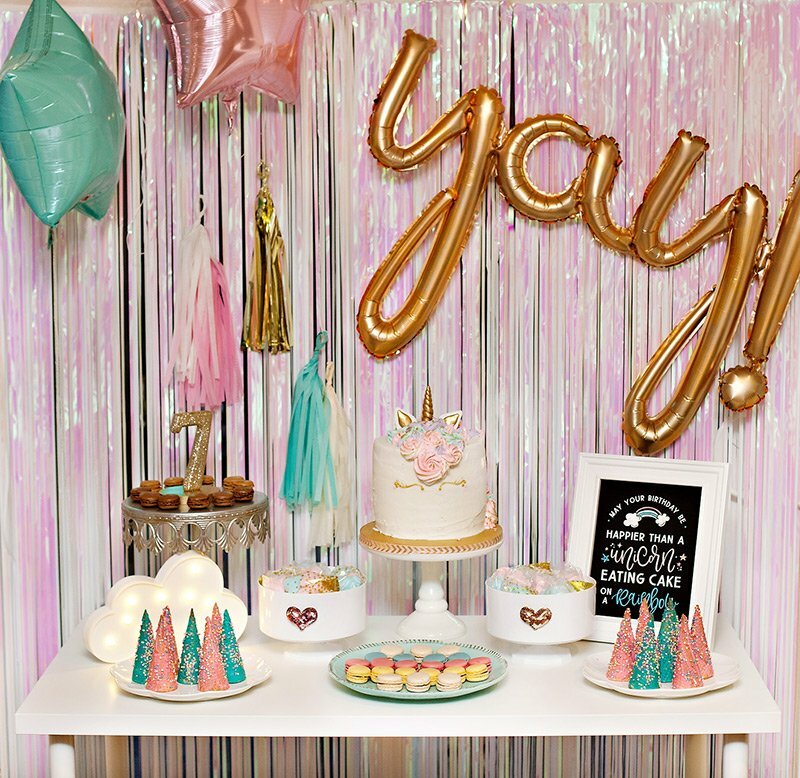 One of my favorite things to do is design dessert backdrops. I found a fun rosette fabric in the downtown LA fabric district and made a simple frame to staple it to. 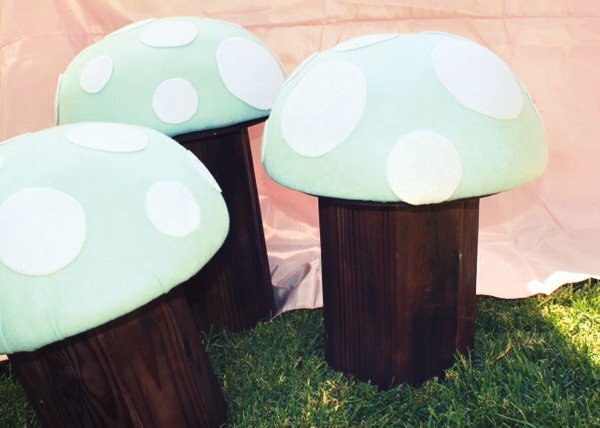 For the kids, the Lux team built mushroom toadstools for them to sit on. The birthday girl got a special gold chair at the head of the table. Alice and Wonderland was hired for entertainment and she read the kids a story, painted their faces and took pictures with them in the photo booth. 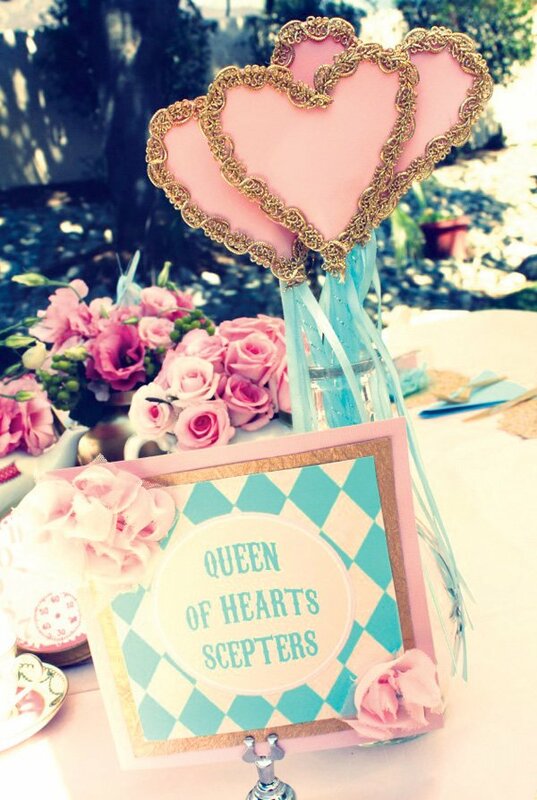 The kids received Queen of Hearts scepters which were made by covering star wands from target with pink scrapbook paper hearts and gold trim. 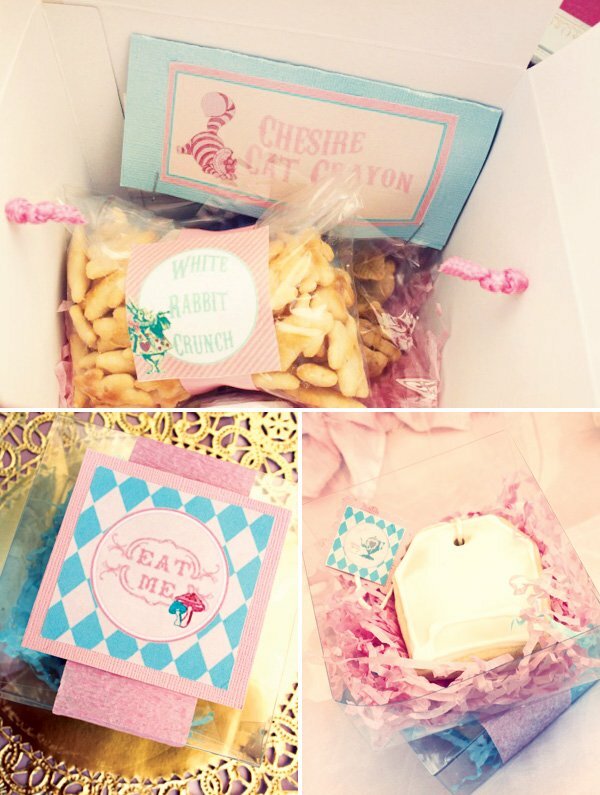 Alice handed each kiddo a favor box filled with Annie’s brand white rabbit crackers and white rabbit graham crackers, a color changing crayon (renamed the Cheshire cat crayon since he changes color) and a fruit roll up. The kids also played croquet that was spray painted pink and pin the smile on the Cheshire cat. For food we kept it tea friendly with croissant sandwiches, cream cheese roll up sandwiches, pasta salad, potatoes salad, and a summer berry fruit salad with a mint lemon infused simple syrup, and a chicken and bread green salad. The kids were served juice from the juice bar. 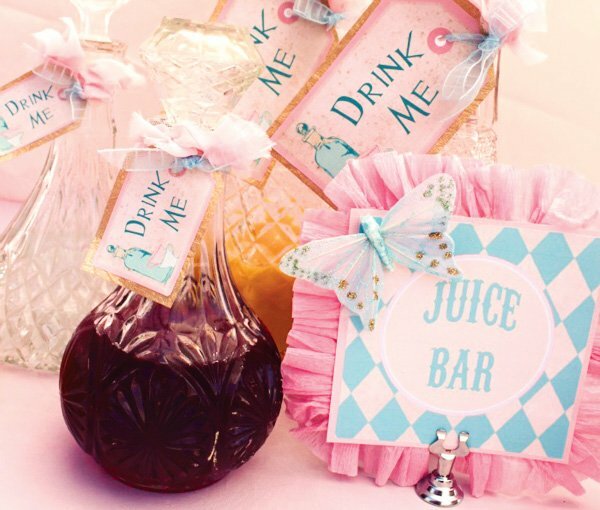 The juice bar was on a gold tea cart and had different decanters filled with various juices. 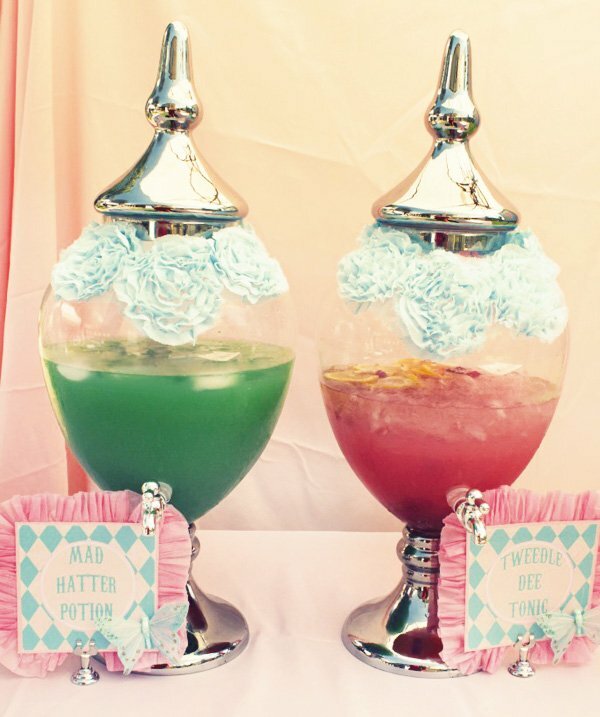 The adults were served Mad Hatter Potion and Tweedle Dee Punch in apothecary beverage dispensers. 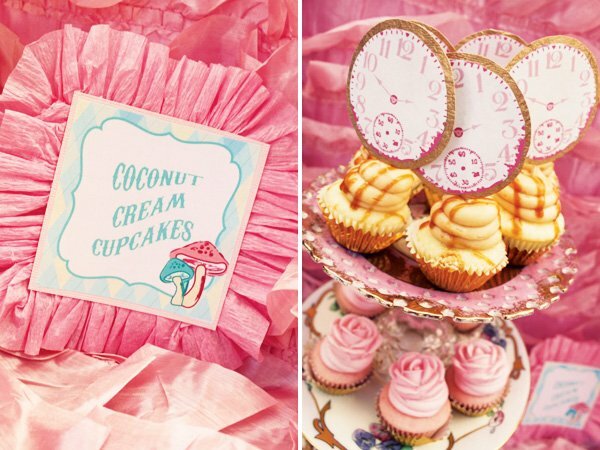 All the food and beverage labels were printed out and trimmed with crepe paper pushed into ruffles. Hello, where were the glass beverage dispensers purchased from? 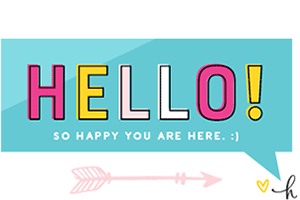 Hi, I love your creative ideas! 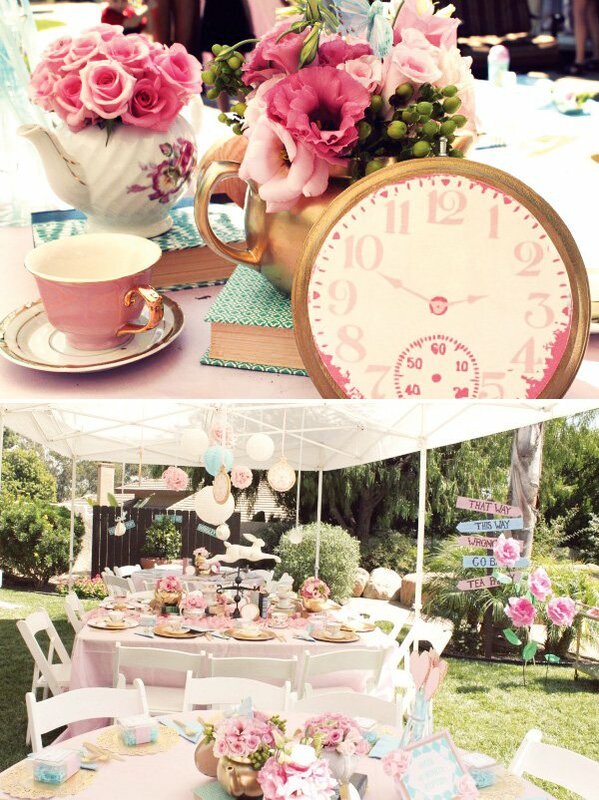 I’m planning a tea party bridal shower. Did you make the clock/pocket watch? if so, can you share how you made it? Thank you!! 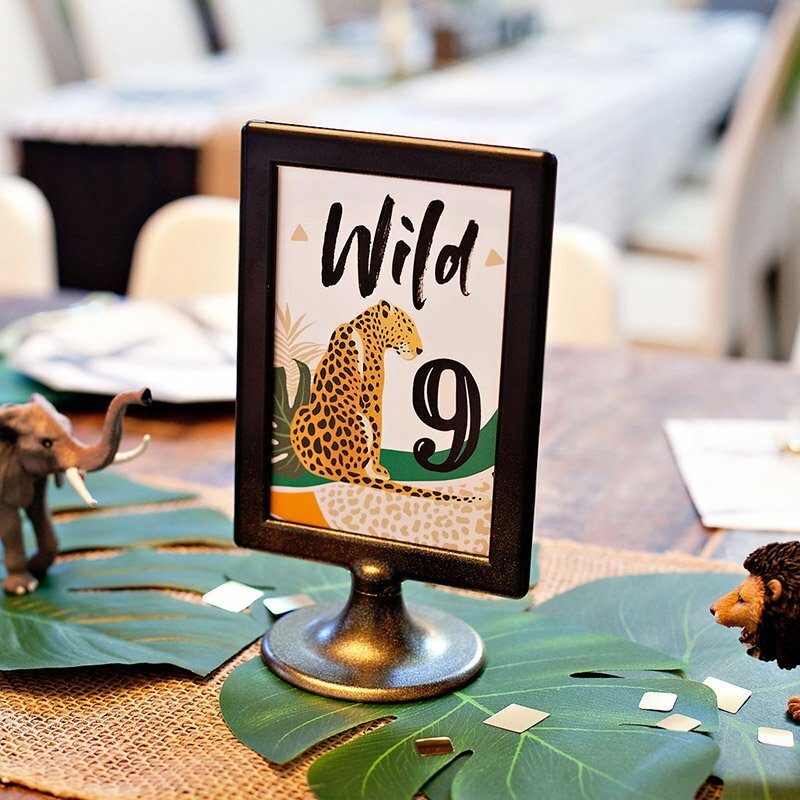 where did you get the wood signs? 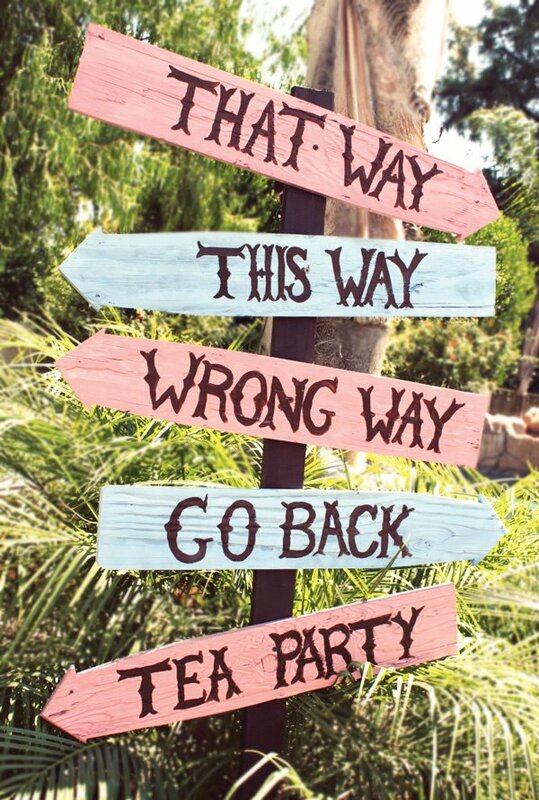 This way, that way, which way signs? 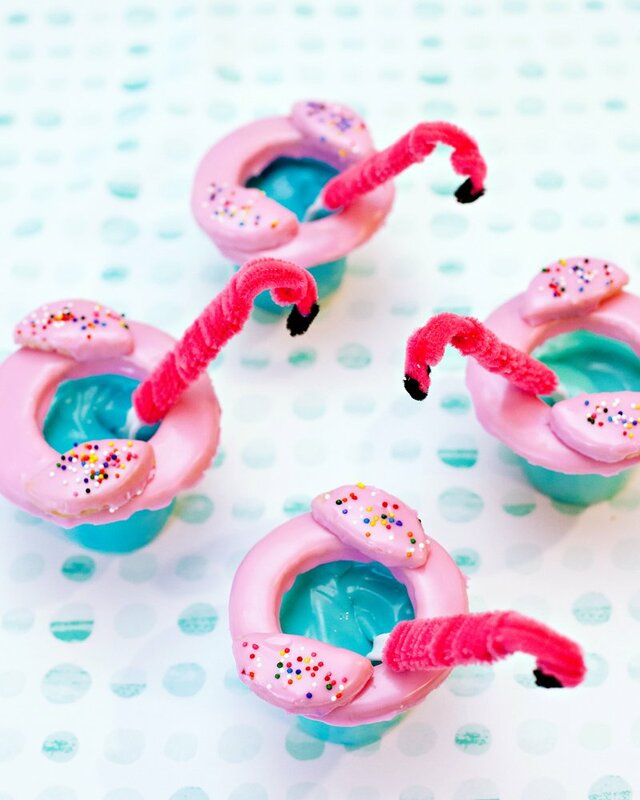 I love them and need them for daughter’s birthday party! Thanks! Where did you get the signs?